Stop Squirrels from damaging property by catch and despatch. Easy to use, fully assembled with full instructions. Sturdy galvanised steel construction with a built-in protective plate and handle. The industry standard cage trap for grey squirrels, accept no substitute. A simple, re-usable, live capture, humane, do-it-yourself cage trap for grey squirrels. Simply bait the cage with some of the squirrel's favourite food; bird feed or nuts or peanut butter are an excellent choice. Select the site where the squirrels are a problem. The product is suitable for indoor and outdoor use and is best set up in an area away from regular human activity. Once set the trap should be left in position for at least seven days before relocation. Be patient and give the squirrel time to accustom itself to the trap.\ Start by putting down food outside the trap as well as inside. Squirrel cage trap can be re-used time and time again. It essential that you check the trap at least once every 24-hours in compliance with the Animal Welfare Act 2006. 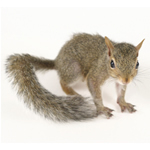 It is an offence in the United Kingdom to capture and then release a grey squirrel. They must be put-down once captured.